I have a problem with my boyfriend’s ex girlfriend. He was still seeing her when we met. At first it was no big deal, him and I had no commitment and were free to see others. But his actions toward me were telling me he wanted to be with me, yet he was still seeing her. This confused me and I confronted him, but he never gave me a definite answer. We had so many ups and downs, and everytime found our way back to each other. I finally started to date others after he told me that’s what he wanted us to do. I figured there was no way we could be together as much as I wanted him. About a week after this discussion, he came to me saying he wanted to start going out more seriously, that he was going to end things with her completely. He had tried being friends with her but she has been in love with him for a long time. They had a sexual relationship and he spent a lot of time with her and her kids. He did what he said, and a week later went to her house to tell her he wanted to cut off all ties. We had a great weekend together after he did that and I thought the problem was resolved. You see, I am very insecure about his “friendship” with this woman. She calls him almost every day and I have no way of knowing whether he calls her (I think he does). Well, we made plans to go out Sunday afternoon and all of a sudden, she shows up at his door claiming she needed to talk about what he had told her. So he cancelled plans with me and she was talking with him all afternoon. I understand she is having trouble getting over it, but he said he would make it crystal clear to her that they could no longer be friends. Now, I believe he chickened out and is still giving her some avenue of hope about their future, maybe without even realizing it, because she still calls him. I don’t want to try to control his life, but I know if the situation were reversed, he wouldn’t have stuck around this long. What’s even harder is that he shares the duplex I live in, so it’s even harder. I don’t feel yet that’s totally “with me” although I feel that if he wanted to be with her he would’ve went to her right? I hate being insecure. We talk about it all the time and I know it ticks him off when I bring it up, because he feels I’m possessive then. But if I relax too much, I’m afraid I’ll be played for a fool. Please help. How do I get over my feelings of insecurity? Is there anything to worry about, or should I let this go and see what happens between him and I? OR am I getting myself in deeper by doing that? Thank you. I understand you have authentic reasons to feel insecure. There has been verbal talk about exclusivity, but you are getting signals that possibly show that he is not as clearly disentangled with the other woman as you would like. You are indeed in a period of heightened insecurity over it. This is a natural stage to be in right now for a relationship that started the way yours did, i.e. when one or both partners are involved with someone else. The sorting out of emotional attachments is going to be a gradual process for the partner who moves from one relationship to another. At first you were not concerned because you yourself were not as emotionally hooked into the relationship with him. So the ambiguities and lack of clear boundaries around seeing other people was not as big a challenge for you, right? But as you got more attached, and he took on more importance to you, it became more of an emotional issue. You went through some back and forth negotiations (on the emotional level) and new clarity was reached. But not total 100% clarity. This is rarely reached in a jump, but is more a gradual process of sorting things out. If you are an optimist, this may still be seen as the gradual clearing process which ultimately leads to the next even more clear level of commitment and solid emotional boundaries in the relationship. If you are a pessimist — which can seem to happen if you let your insecurities dominate your inner emotional landscape — then maybe you focus on the threatening aspect of the situation and think about letting it all go. As long as you see this as an issue outside of yourself, you will simply be like on a yo-yo string, being pulled back and forth — based on his emotional responses (and how you interpret them) to the other woman. Look, he is going to have emotional responses to her. This doesn’t necessarily mean his spine is made of jelly and that she can emotionally blackmail him into reconnecting. I don’t know what his spine is made of. And at 6 months, neither do you. Maybe he doesn’t even know. I have no idea what his inner emotional landscape is, without actually talking with him. And for the moment, that only keeps you from grasping your real opportunity here. Your real opportunity — and perhaps the only thing you can really count on — is for you to get a better grip on your own inner emotional landscape. You have some issues around insecurity. (As if we all don’t.) Thing is, this category of internal issue is precisely what confounds even the best of relationships and creates alot of blockages down the road when it resurfaces again (and it will, for other reasons) — blockages to authentic and robust intimacy. 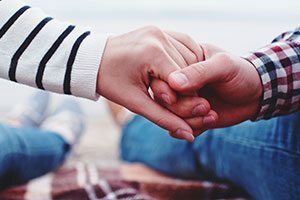 When you go outside yourself — looking to him and his actions for a solution to prevent your insecurity — you are creating a kind of codependent linkage that ultimately will not serve you or this relationship (or any future relationship, until you take care to change this pattern in yourself). So the interesting opportunity for you and you alone is here — right now in this relationship — to commit yourself to doing some personal growth work on your internal emotional landscape. In other words, learn how to better take care of your insecurities (and any other negative emotional states that come up for you in love). Self-care in the emotional realm is the single strongest skill that an individual can develop — that will enable him or her to achieve healthier and higher caliber intimate relationships. So this is your opportunity to do that kind of personal growth. Think of it this way. If you focus on him and what your strategy should be to minimize your insecurity, i.e. let go, relax, leave, whatever — then you are missing the opportunity to do your own internal work. You are looking on the outside (at him) for a change to happen — and missing the opportunity on the inside to go ahead and make a change (in you). You cannot control what happens on the outside. The only area where you can develop mastery is inside. The relationship with him will turn out either one way or the other. Either you two will stay together. Or not. The question is, where do YOU want to be, regarding that personal growth, either way? If you do the personal growth and you two stay together, you will be setting up conditions for a higher quality relationship sooner, and you will be unplugging the polarity pattern that the two of you are already developing over this issue (which is your “insecurity” = his label that you are “possessive” on one side of the polarity). If you do not stay together, and you end up having grown personally, then you will be in a far better position to see and get the kind of relationship you want the next time around — without having to go through this issue again. Relationship is our teacher. Love brings up our lesson plan. And we just have to face the same lesson again, until we learn it. Either way it turns out with him — it is only to your advantage to change your focus and work with this situation as an opportunity for you to foster your own personal growth around insecurity and your responses to insecure situations such as this one. ← How can I get him back again?